The book is already attracting a lot of interest. It featured in the May 2010 edition of Practical Family History magazine and the June 2011 edition of Family Tree magazine. Such has been the interest that a special site on the pictures and their history is now active, visit Go Home On A Postcard. There is also a special Walking Pictures Flikr collection online, set up by Easy On The Eye, where you can see some more images of this sort. If anyone out there has any walking pictures in their family albums – they were still being taken as recently as the early sixties – we would love to hear from you with a view to perhaps including them in the book. UPDATE – Colin Harding who works at Bradford Media Museum (and is author of a recent book called Classic Cameras) has been in touch, and we had a meeting recently about the Walking Pictures title. Colin curated an exhibition about seaside photography at Bradford a few years ago, and we are hoping to use some material he collected for that in the upcoming book. Below are two examples to show what these images look like… and there is more information and the cover of the book on the ‘in the pipeline’ section here. Carole and Brian in Skegness. 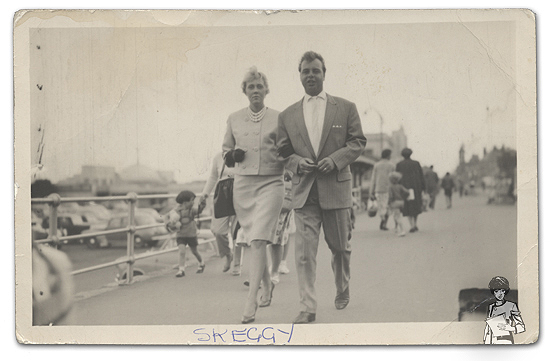 This is Carole and Brian on holiday in Skegness (or Skeggy to many trippers) in 1961. Carole says they got used to the street photographer, and bought a few of the postcards as a souvenir. She also adds that while they look as if they're on their way somewhere very posh, they were actually off to watch the early evening wrestling match! Off for a read... We do not know who this family are, but the photograph was taken at Mablethorpe on a walkway known locally as 'The Pullover', which took visitors up from the town, over the dunes and onto the seafront. Dad has a daily paper, mum is carrying handbag and a camera in one hand and clutching a serious fashion magazine under her other arm. Daughter has a handful of new comics and Uncle has a book, so it looks like a serious reading session in deckchairs is on the cards. Hello, I have a couple of “walking pictures” of my grandmother (born 1884), presumably taken in Hull, which is where she lived, in what looks like the 1930s and 1940s. The earlier one has WALKING PICTURES stamped on the back, the later one MOVIE PHOTO. Do you know if these were the names of the companies that took the pictures or the generic term? I’d be happy to send you a digital photo of each (front and back). 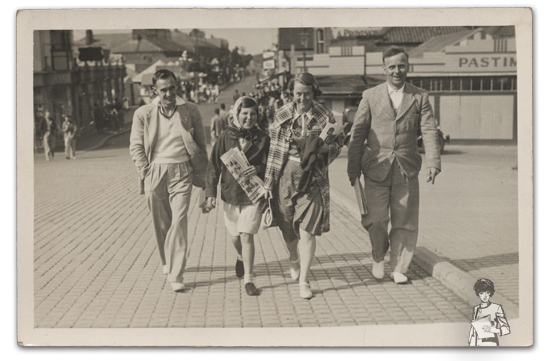 I have found three possible walking photographs from my family photo collection. They are probably 1920s, 1930s and 1940s. I can send scans of all three if you would like to see them. I have 3 photos taken in Wichita, KS during the 50’s if you are interested. Hi Simon, In working on a scrapbook layout and I decided to do some research online about “Walking Pictures” so that I could add a little journal to my layout. I found this site, and if you’re still interested in collected pictures of Walking Pictures, send me an email and I’ll send you a copy of the picture I have of my English grandmother before 1923 (she immigrated to the United States in 1923). On the back of the picture is stamped “Walking Picture.”. What a great idea for a book and good luck in your endeavor. Joyce from Los Angeles, California. I have just found this site and thought you may be interested in my experience. Whilst still in school during the late 1950’s I worked for a “Walking Picture” man called Les Wilson. Wilsons walking pictures, we had Kiosks on several holliday camps around Rhyl and Abergele North Wales. The photographers used Leica 250 reporters. I used to go straight from school to work in the darkroom where we developed printed washed and glazed hundreds of pictures every evening. They were delivered to the kiosk ready for the punters the next day. We printed two identical black and white pictures on one piece of postcard size paper using Leitz Focomat enlargers. I have lots of original examples of the pictures and have scanned several. Fascinating John, I’ll drop you an email so we can find out more. Please can I PRE-ORDER the Walking Pictures BOOK featured on Radio 4 today? I am aged 90, and visited Bridlington in summer in the 1920’s from Harrogate with the family, riding in the dicky of our car. Much looking forward to your reply! I have a lovely photo taken on pier with the Victoria theatre in the background and two ladies in 20s/30s dress walking. I bought it at a junk shop many years ago because the ladies look so like my Gran and her sister. If you’d like a scan please do email me. I’ve just done some research on the internet and it looks like Colwyn Bay pier. The theatre burned down in 1922 so it must be 1920s dress! Been looking at some old photos after the death of a muched loved family member and found one taken in Oxford, did you cover that area ? It was taken in 1931.I used to live in Lyme Regis, Dorset and may have one from the 1950’s but does’nt say walking pictures on the back. Hello, I’ve got a “walking picture” of my great grand parents taken on Llandudno Pier. My guess is that it was taken in the 20s. On the back it says 729136 “Happy Snaps” are permanent, bright & clear, they re only taken on Llandudno Pier. “HAPPY SNAPS” Reminder of Happy Days at Llandudno. Always return a print when ordering extra copies. 3 more for 1/- 9 more for 2/- Enlargements size 4 x 6 1/- each 3 for 2/6. If you’d like a copy, please let me know.